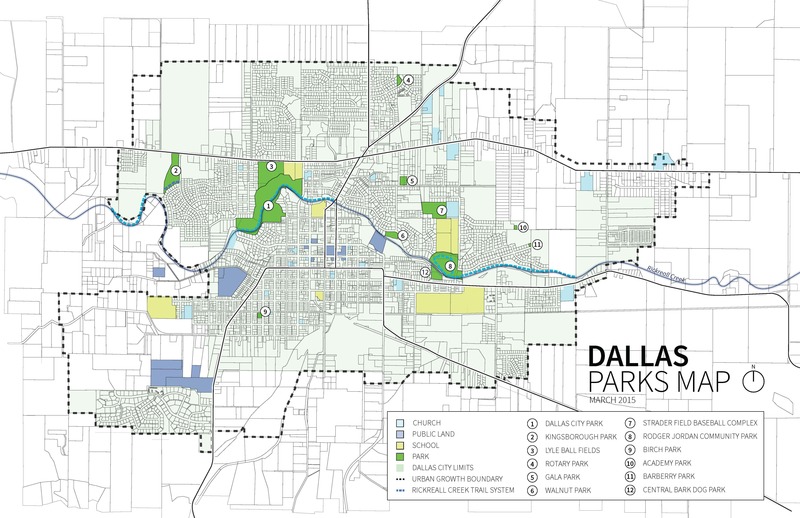 This webpage provides a "snapshot" or overview of the 2015 Dallas Parks Master Plan. Scroll down the page to view general findings and outcomes of the Plan. Park facilities help improve a community’s quality of life and meet residents’ demands for recreational experiences. 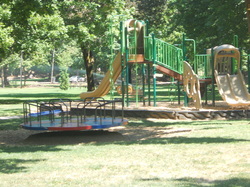 Providing adequate park facilities is a challenge for many communities. Limited resources – both in terms of staff and money – present significant challenges for local municipalities to develop and maintain park systems. Identifying system priorities and matching those with available resources requires careful planning. 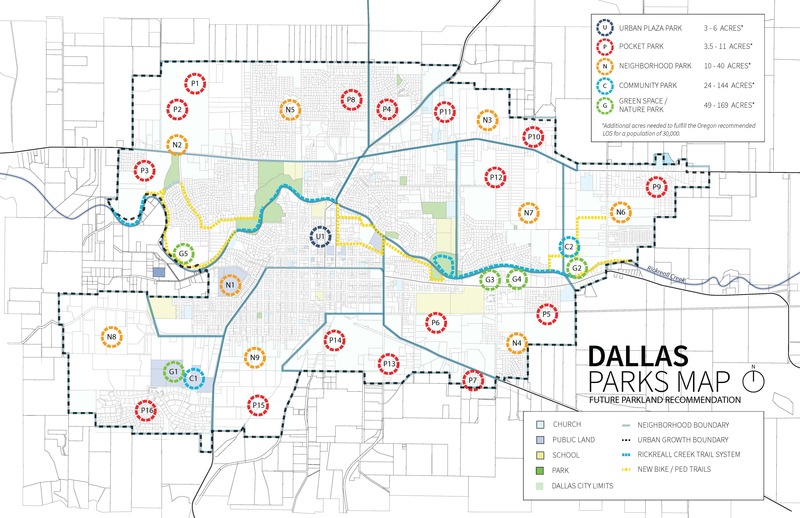 The 2015 Dallas Parks Master Plan identifies strategies and actions for development, maintenance, operation and funding of the City of Dallas’s park system over the next 20 years. Through the adoption of this plan, the City intends to improve existing parks and carry out strategic parkland expansion to meet the needs of current and future residents. This summary highlights existing facilities, key findings from the community needs analysis, vision and goals, and recommendations for park improvements and parkland expansion described in the 2015 Dallas Parks Master Plan. one partially developed trail system. Dallas’s park system includes approximately 91 acres (of which nearly 89 acres are developed or partially developed). The Level of Service (LOS) analysis is based on existing park acreage and current population estimates for the city. The LOS is expressed as the ratio of developed park acres per 1,000 residents. The current LOS provided by all parks (developed and undeveloped) in Dallas is 6.12 acres per 1,000 residents and the current LOS provided by trails is 0.16. This analysis is based on the estimated 2014 population of 14, 800 residents. 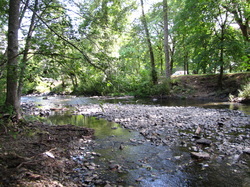 This LOS is slightly lower than the range of 6.25 - 12.5 acres per thousand residents recommended by the Oregon State Comprehensive Outdoor Recreation Plan (SCORP). The 2015 Dallas Parks Master Plan sets a Level of Service goal of 6.25 acres per 1,000 residents. It is important a park system is accessible to all local residents, regardless of geographic location within the urban growth boundary. Currently, Dallas contains community, neighborhood, pocket, nature and special use parks well as a growing trail system along Rickreall Creek. Each park type has a different service area based upon the park’s size and type. 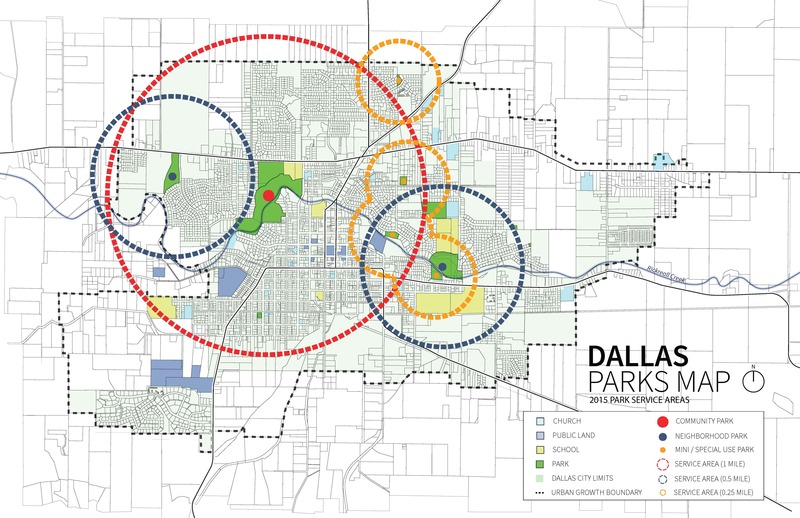 The Dallas Parks Board established the following service area standard: "all residents should live within a 1/2 mile radius of a Neighborhood Park". Based on this standard and findings from the 2015 Dallas Parks Master Plan process, areas currently underserved by the existing park system include neighborhoods in the northeast, east, and south (as shown on the map above). Dallas residents have a sense of pride with the quality, quantity, and reputation of their park system. 80% of respondents who participated in the public engagement process for the Plan stated they were "satisfied" or "very satisfied" with the overall quality of the parks. Among those parks most heavily used were Dallas City Park (visited at least once in July and August 2014 by 90%), Delbert Hunter Arboretum and Botanic Garden (56%), Dallas Aquatic Center (53%), and Rickreall Creek Trail (50%). Those least visited were Walnut Park (5%), Dallas Senior Center (8%), Rotary Park (11%) Central Bark Park (12%), and Gala Park (16%). Dallas residents prefer parks and a park system with a variety of activities and elements. 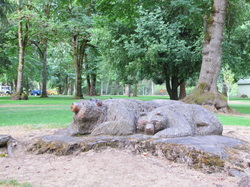 The three most desired park elements were water or splash play areas, unpaved and paved trails, and green space or natural areas. The three existing park elements respondents felt need the most improvement were restrooms, picnic areas, and general maintenance. Respondents felt people with disabilities and senior citizens are currently underseved by the park system. 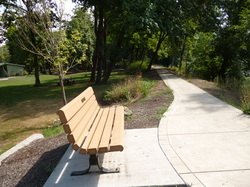 Residents value ease of access or short trips to nearby parks. Communication within and about the park system could be improved; including interpretive signage, information on volunteer opportunities, and park decision making processes. community to its natural surroundings. Identify areas within the urban growth boundary for strategic expansion of the Dallas Parks System. Establish a recognizable identity across the Dallas Parks System. Ensure that all parks are properly maintained to guarantee safe, clean conditions for all users. Facilitate the establishment of a non-profit “Friends of Dallas City Parks” organization to help care for the park system through volunteers to help with maintenance, advocacy, and fundraising efforts. To learn more about the targeted action items of the 2015 Dallas Parks Master Plan, click "Explore the Plan Online". The City of Dallas will need to acquire additional parkland during the 20-year planning period. The population of Dallas has been projected to reach approximately 16,651 by the year 2020. To reach the Level of Service goal of 6.25 for that projected population, Dallas would need to add 13 acres of parks and open space to the existing park system. The City should plan to provide park facilities where future residential development is expected. As additional land is acquired the goal should be to address currently underserved areas primarily in the neighborhoods north of West Ellendale Avenue, south of downtown, and along the eastern edge of the city. This is not intended to prevent the city from acquiring lands in other areas if opportunities emerge; rather to focus on specific areas of need. To proved additional guidance on parkland acquisition, development, and improvement, the 2015 Dallas Parks Master Plan also contains: (1) potential policy changes, (2) design guidelines, (3) a concept plan for Kingsborough Park, and (4) projected expenditures and potential funding options. To learn more, click "Explore the Plan Online".